This can now send money for you. Scary? The major limitation of many smartwatches is that users still need to have their phones on them despite the impressive tech on their wrists, but the wearables are slowly becoming more independent. Case in point: Pebble smartwatch users with Android phones just gained the ability to take action directly on the watch in response to certain notifications from the phone. For example, if you receive a text message, you can reply with an emoji directly from the Pebble on your wrist. Or, if you get a Square Cash request, you can send money from the watch's tiny screen. This functionality arrives in the version 2.3 update of Pebble's Android app. Here's a video of the emoji feature in action. 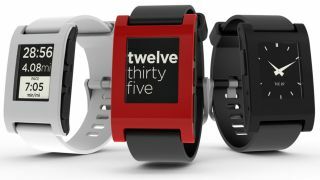 Pebble smartwatches have always been cute, and it's nice to see their feature set jacked up, even though their inferiority complex is showing through. Pebble Community Manager Joseph Kristoffer says "it's Android Wear notification compatibility on Pebble," though he also points out that actual Android Wear watches don't have some of these features. But "if you can do it with Android Wear, you can do it with Pebble," Kristoffer wrote in a blog post. Users with Android 4.0 or higher can join the Pebble beta testing program to get access to the 2.3 app now.